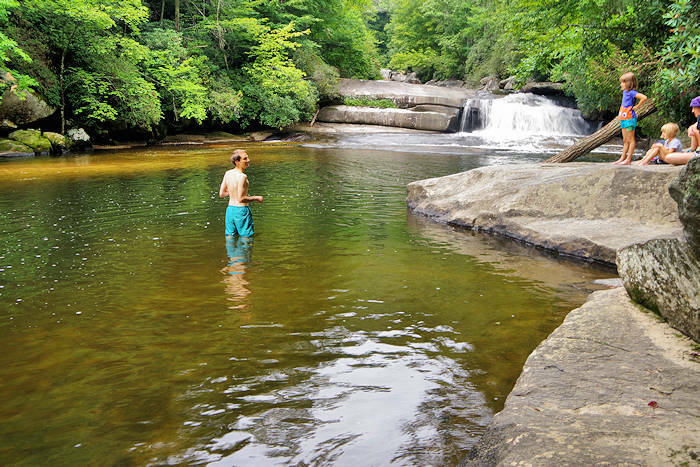 Hidden Falls is a serene family-friendly swimming hole in Pisgah National Forest just down river from the towering Rainbow Falls. It's on the Horsepasture River "hidden" just a few steps off the main trail. Most hikers miss it. The waterfall is less than 10 feet tall, but it drops into an idyllic pool surrounded by boulders that act as a small dam and provide sunning and picnic spots. The Rainbow Falls Trail begins in Gorges State Park at their Grassy Ridge parking area. It's about 1.3 miles to Hidden Falls (about 2/10 of a mile before Rainbow Falls). The trail is mostly downhill - so you will have an uphill walk much of the way back to the car (important to remember if you have small children!). There is no sign for the short side trail to Hidden Falls. It's just before your final ascent to Rainbow Falls (an obvious uphill section with stairs). You'll see a wide area in the main trail with some obvious trails to the left to the river. The waterfall is tucked away on your right, so you need to be on the river to see it. Since most of the river is rapids, this serene pool tells you that you are at the right spot. 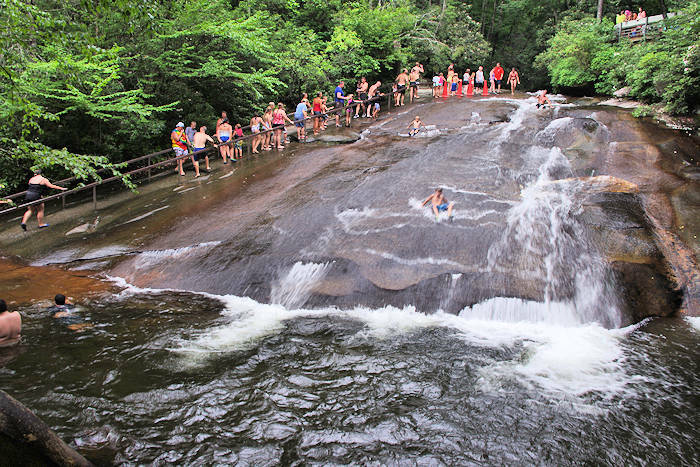 About a third of a mile beyond Hidden Falls is the very popular natural water slide of Turtleback Falls. It's for experienced swimmers and the more adventurous. This area is a temperate rain forest, getting 90 inches of rain each year. So expect summer showers. There are no facilities at the swimming area. There are restrooms at the parking area. Bring plenty of water and snacks. Don't forget the sunscreen! The Horsepasture River is an 18-mile-long National Wild and Scenic river drops about 2,000 feet in elevation, creating many waterfalls and rapids along the way. 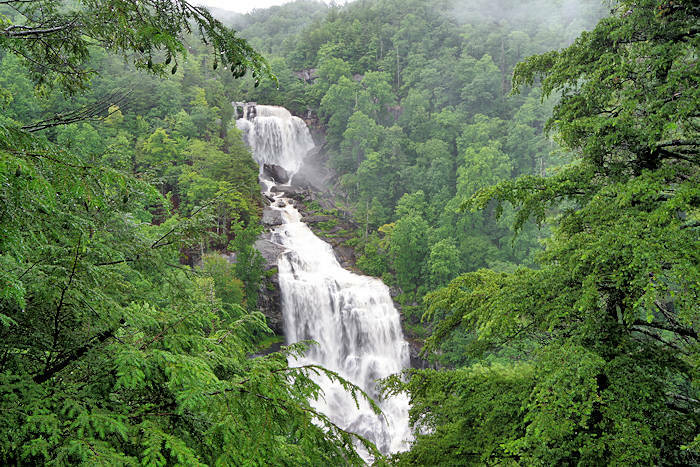 Read more about nearby Rainbow Falls, Turtleback Falls and Stairway Falls. See our other favorite mountain swimming holes. Gorges State Park is 55 miles southwest of Asheville (1.5 hours driving time). From Asheville, take I-26 East to exit 40. Turn right onto NC 280 (toward airport) and go west to Brevard. Follow US 64 West through downtown Brevard toward Sapphire. Turn south on NC 281 in Sapphire. The park entrance is .7 miles on the left. The Grassy Ridge parking area is about 2 miles from the entrance. Street address: 976 Grassy Ridge Rd, Sapphire, NC 28774. Don't use GPS since it's often not reliable in remote mountain areas.